Poverty is inversely and inextricably linked to education. The more education you have, the more likely it is that you will be able to increase your income earning capability to pull your family out of poverty. But here’s the catch: poor people are less likely to go to school. 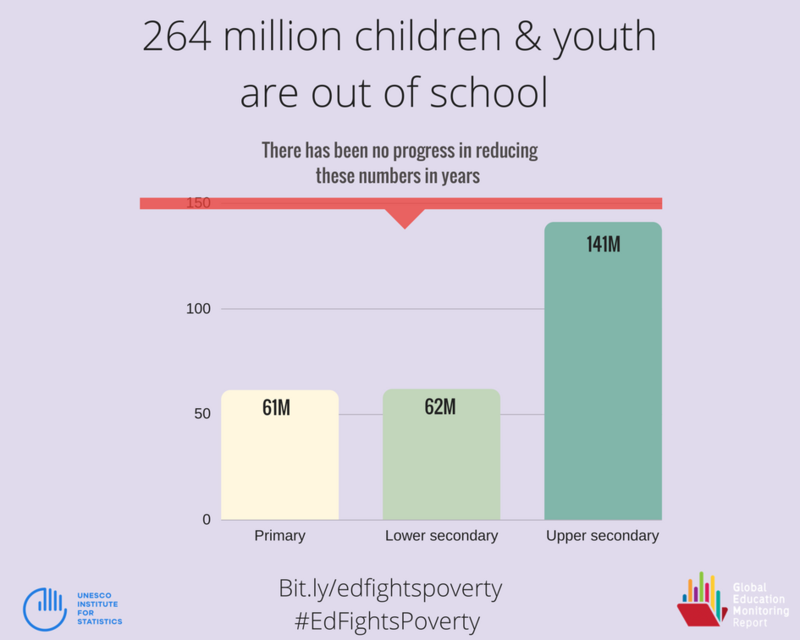 Plus, most of the out-of-school children and youth live in low income countries with and have fewer means at their disposal to access quality schooling. This has tragic consequences and perpetuates intergenerational poverty. In other words, the poor stay poor. Clearly, policy responses and aid efforts have to focus on lowering barriers to break this negative cycle and to give the poor a chance to learn. Let’s start with some numbers. According to a policy paper by UNESCO, 264 million children and youth are out of school, or 9% of the world’s young people, a figure that has remained constant over the last eight years. In other words, the previously downward trend has stabilized and there has been no recent improvement in the out-of-school rate, despite significant progress (especially at the primary level) in the in the early 2000s. Looking at it from a regional perspective, 33 million primary-aged children and are out of school in sub-Saharan Africa (more than half of the total out-of-school population for this age group), and 60 million youth at the lower and upper secondary levels. In Central Asia and Southern Asia, 11 million children and 70 million youth are out of school. Overall, the chart below shows that while there are out-of-school children of all ages, upper secondary school-aged youth are clearly the worst off. In poor regions, this tendency is even more pronounced: 62% of youth in low-income countries are out of school. That rate falls to 47% for lower-middle income countries, 22% for upper-middle income countries, and 7% for high income countries. There are multiple causes for the high out-of-school numbers, including conflict and the growth in the refugee population, gender, disability and ethnicity. In addition, a lack of quality education means that, sometimes, children are finishing primary school without the basic skills which would allow them to continue their education at the secondary level. Poverty, though, transcends all other barriers. In lower-middle income countries, children from the poorest 20% of families are eight times more likely to be out of school than children from the wealthiest 20%. Education is expensive and direct costs like school fees, and indirect costs like books and uniforms, remain out of reach for many poor families. And because going to secondary school is often not compulsory, it makes more economic sense for poor families to send their children to work and for the girls to get married, reducing the cost of their upkeep on family finances. This further reinforces the intergenerational poverty cycle. Millions of children and youth are not going to school because their families just can’t afford it; yet, at the same time, education is the main avenue for getting out of poverty. Research shows that each additional year of schooling can increase income by at least 10%. In fact, the UIS paper shows that just two more years of secondary schooling could help lift 60 million people out of poverty. 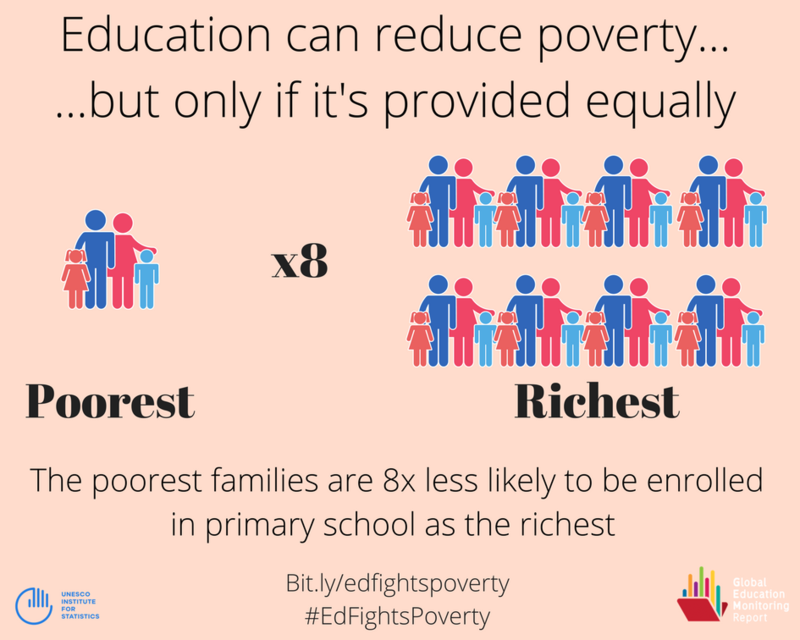 If all adults had a secondary education, 420 million could be lifted out of poverty. That’s impressive! An educated person has more skills and knowledge which together increase productivity, and individuals with more education will look for ways to diversify their sources of income. Educated people are also more resilient to change – economic, environmental and personal. Education is especially empowering for girls and women. Mothers who can make better decisions for their families can deeply impact the push out of poverty. They may choose to have fewer children and to provide the children they do have with access to vaccines, medical care, better nutrition and schooling. FACT: an educated mother is more likely to send her own children to school. This can break down the persistent intergenerational effects of poverty and inequality. This involves targets that, for example, move toward free, universal education for primary and secondary school by 2030, the provision of pre-primary school, teacher training, gender equality in access to school, and better quality of education so that children who are in school can actually learn. On our end, several of our projects in the last few years have focused on secondary school-age students – providing a place for the children we supported at the primary level to continue their education. This year, we are working with MWEDO, through the Stephen Lewis Foundation, to educate 100 girls in Tanzania’s Maasai Mara. This poor, rural population is generally under-educated, particularly girls who are often married by the time they are 15. You can read about our project HERE. At the 60 million girls Foundation, we truly believe that educating all children and youth, especially girls, is crucial to reducing poverty and increasing individual wellbeing. Let’s work together to find ways to get all children in school and learning.